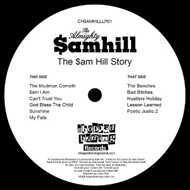 Following on from the excellent "The Preface" on Chopped Herring Records, The Almighty $am Hill drops this, his incredibily dope debut album including production from Money Boss Player's producer Minnesota and Timeless Truth/Your Old Droog producer RTNC. Mastered by Lewis Parker this future classic will take you on a poetic stroll through the harsh streets of the Bronx, accompanied by a crazy classy funk/soul score. No doubt cats will sleep, but this artist IS one of the greatest to ever do it - that's a Herring promise!! !